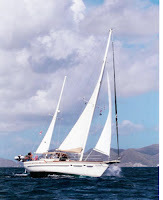 Fidelity, a 46-foot Jeanneau sloop, has the forward cabin available for a seven-night shared charter during the period of November 28 to December 17, 2009 in the Virgin Islands. Let us know what dates in this timeframe work best for you. This special offer for a cabin charter has expired. The other cabin has been booked, but the charterer would like to share expenses with another couple, and thus the forward cabin is available. Hope you will be able to take advantage of this opportunity. We recently heard from Phil & Laura of the charter yacht Storm Petrel and they made it up to Newport from St Thomas in just 10 days! Nice to hear that they had a good sail and arrived safely, but it is also an inspiration for our journey from St. Martin to Newport that will be starting soon. We really look forward to seeing Storm Petrel up in New England. Phil is originally from Cambridge and he sails most every year from the Caribbean to New England. He really knows the area and I'm sure he'll have lots of "local knowledge" tips for us. STORM PETREL is available for charter this summer in New England. They are based in Buzzards Bay so they have access to some incredible cruising ground, plus you could also use Storm Petrel as your base for the Newport Folk and Jazz festivals in the beginning of August. 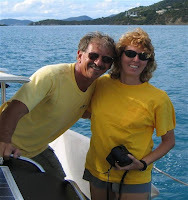 Storm Petrel is a Robert's designed 44-foot Offshore 44 sloop. Phil Levine is the captain and owner of Storm Petrel. His chef/crew is his girlfriend, Laura. Storm Petrel has a queen cabin aft and a V-berth cabin forward. 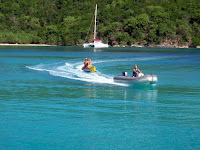 They have an 11-foot dinghy with 15HP motor, windsurfer, hammock, snorkel equipment. Besides enjoying windsurfing, Phil also does kite boarding! In fact he has three kites and a couple of boards on his boat, in addition to his wind surfing gear. They also like to play basketball, so maybe you can squeeze in a bit of BB court time, too! Alcoholic beverages are not included in their rates, but will stock with your preferences at cost. 4-day itinerary (can easily be expanded, of course) Click map for larger image. 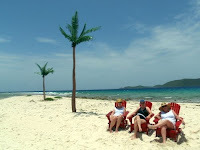 Contact Paradise Connections Yacht Charters to check availability for a summer sailing vacation in New England, or perhaps you have some time in mind for a winter charter in the Virgin Islands. 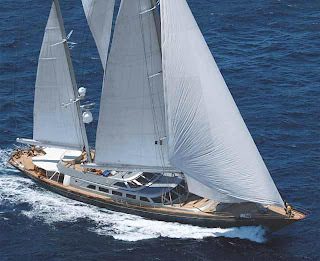 The s/y Gitana, a beautiful 36m Perini Navi, is available from 27th June to 4th July 2009 in Corfu, Ionian islands with no delivery fees. 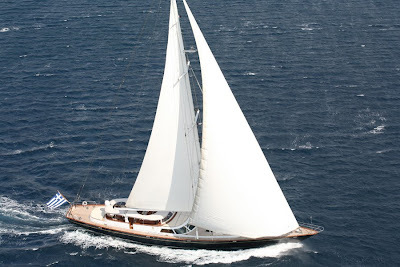 The owner offers the yacht for this week at the charter rate of 46,500 euros. 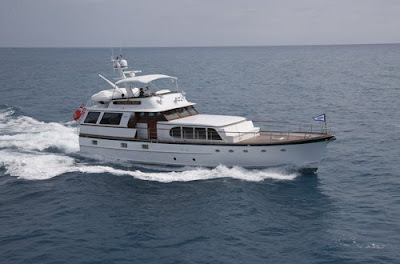 Gitana has a crew of 9 and accommodates up to 9 guests in 3 cabins. 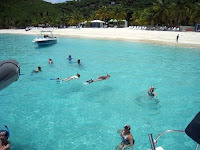 Up to 15% discount available on select catamarans for July & August 2009 charters. 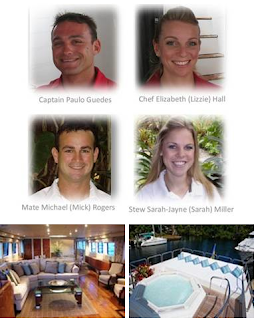 Your crew will arrange a customized itinerary to accommodate everyone onboard. Dive ship wrecks or hike moutains, windsurf in lagoons, kayak beautiful coves and snorkel in caves or just relax on a beautiful beach or on board the yacht with a chilled Mojito in hand! 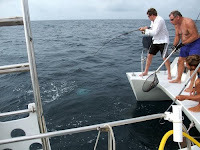 Contact Paradise Connections Yacht Charters for rates, availability & more information. Take advantage of the very limited availability that THE LADY J has to offer this summer! Captain Paulo and Chef Lizzie lead the phenomenal crew onboard this gorgeous 105' Diaship-Heesen that charter clients cannot seem to get enough of, proven by the incredible amount of repeat business THE LADY J generates. THE LADY J will be in New England for July, August, and September, with very limited availability. Book early to avoid disappointment, as availability is not guaranteed for very long! 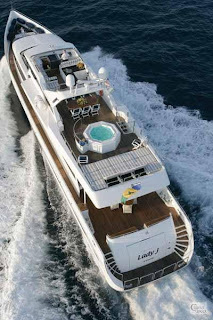 THE LADY J sleeps 8 guests in 4 staterooms, and is available from $43,000 per week, plus expenses. 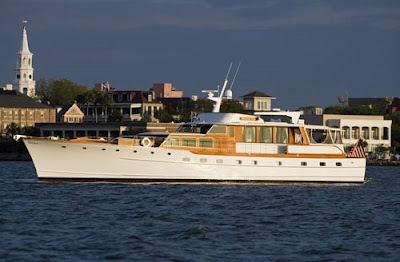 WISHING STAR, the beautiful classic 84-foot Trumpy motor yacht, is currently located in Charleston and available for a charter cruise north to Newport in the next few weeks. This would be an interesting journey. 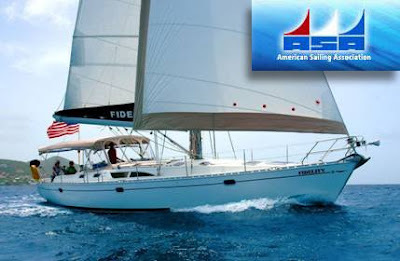 After her transit, Wishing Star will be available in New England this summer for yacht charters. 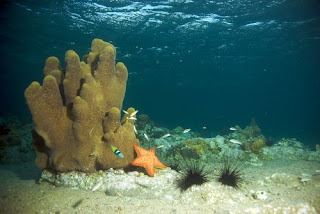 Wishing Star accommodates up to 6 guests in 3 staterooms (one queen & two twins). A true classic gentleman’s motor yacht, Wishing Star is exquisitely maintained with a handsome and impeccable interior. She is the ideal choice for those who appreciate traditional elegance afloat. An experienced, and genuinely welcoming crew of two with a third crew available on an as needed basis. Want to charter an OYSTER for your sailing vacation this year? Contact Paradise Connections! We are pleased to announce that RAVENOUS, a new 2008 Oyster 82, will be available for yacht charters in the Caribbean this winter 2009/2010 season. 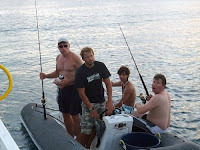 Ravenous with a crew of 3, accommodates up to 6 guests in 3 cabins (1 double & 2 twins). Currently available for the holidays! 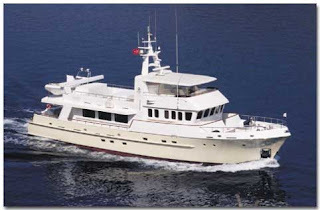 M/Y TIVOLI is available for summer 2009 in New England for term charters or day charters at very special rates. $5,000 for an 8-hour day charter for up to 12 guests which includes fuel, lunch, standard bar, snacks & dockage -- what a deal! TIVOLI is a 90-foot Doggers Bank motor yacht and can accommodate 6 guests in 3 cabins (or a family of 8 with use of Pullman berths). Her three staterooms radiate from a central foyer. The master stateroom has a centerline queen bed & separate his 'n hers baths, one with a marble shower and one with a steam shower plus whirlpool tub. Two guest staterooms have twin lower singles and enclosed marble showers in the en suite baths. TIVOLI is fully air conditioned through out. 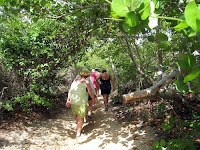 on new sailing vacations taken before December 18 2009. Children from 10 to 14 years old are half price! Charter must be confirmed by June 26, 2009. *On new bookings only. For each adult travelling one child under 9 goes free. Between July 1 - December 18 2009. No other discounts applicable. Your charter must be confirmed by June 26 2009. 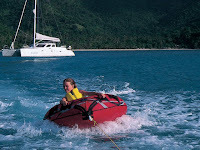 Charter the motor yacht VICTORIAN ROSE in New England this summer (winters in Bahamas). Victorian Rose is a 63-foot Berger motoryacht which accommodates up to 4 guests in 2 cabins: full-width Master with queen berth and ensuite head and shower, and Guest Twin with separate head and shower. Guest accommodations are located aft and crew quarters are forward with their own head and shower. The aft deck is air conditioned and has removeable Isenglass curtains. Victorian Rose features state of the art entertainment system. Victorian Rose is ideal for one or two couples, and small families. 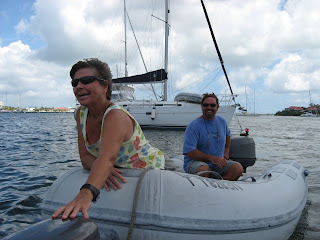 While on our way to buy yet again another necessary widget of some sort for our boat at Budget Marine in St. Maarten, a couple in a dinghy zips over to us. Wow, it's Dominique and Michel from one of our favorite charter yachts, BLITHE SPIRIT. We both turned off our engines and chatted for quite awhile about this and that while drifting around the bit of the lagoon between the marine stores and Simpson Bay Marina. It was so nice to see them and to catch up on things. 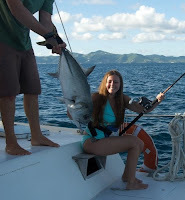 This is one reason why we, Paradise Connections Yacht Charters, are different from other brokers. We live aboard our own sailboat in the Caribbean, so we frequently see the charter yachts, shoot the breeze, and hear the gossip! We plan to sail up to Newport for the charter show and hang out in that area for the summer which will be very interesting, as well. 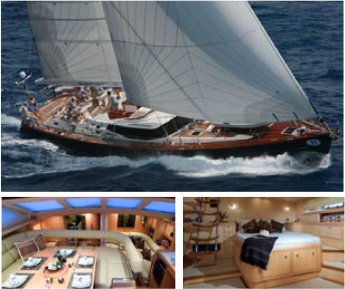 Most brokers would prefer a 747 but we're different and want to sail the thousand-plus miles. 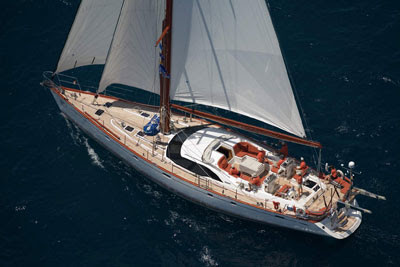 Blithe Spirit is making its way down to the Grenadines for the summer where they will be available for charter through about July 24, 2009. 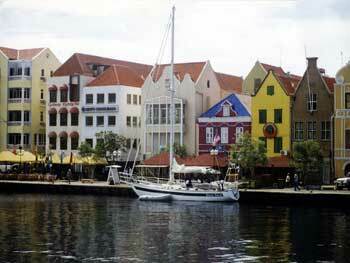 Then they will return from their summer vacation and start chartering again the beginning of November. 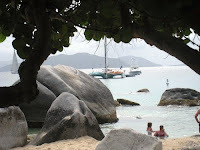 They have a New Year's charter in the Grenadines so they will stay south through the beginning of January and then they are booked in mid February in the Virgin Islands. So, for January and the first part of February you have your choice of either the Grenadines (or possibly other islands on their way back up to the VIs such as the French islands, Antigua, or St. Martin) or the Virgin Islands. Blithe Spirit is a 52-foot Irwin ketch owned & operated by Michel and Dominique, a Canadian couple who used to have an Inn in Quebec & a televised cooking program in Canada. They are certainly not strangers to good hospitality and I LOVE Dominique's Chocolate Mousse!!! Blithe Spirit is fully air conditioned and accommodates up to 4 guests in 2 cabins. Excellent yacht for couples or families. Please note that Blithe Spirit is a non-smoking yacht. ANDROMEDA LA DEA offers SUMMER SPECIAL! 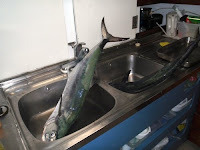 8 days for the price of 7 for all Summer 2009 Season charters contracted between now and June 30, 2009 for Mediterranean yacht charters. 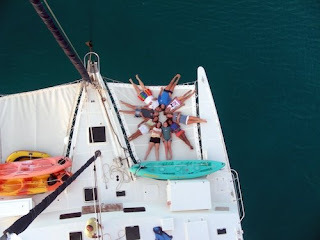 Here's some new photos from the charter yacht PROMENADE, a 65-foot trimaran, which offers diving along with lots of other fun in the Virgin Islands! This photo looks like Kerry either set it up, or she took a picture of the aquarium in her dentist's waiting room. She assures me that it really was this way. This family had a great time on Promenade this week. 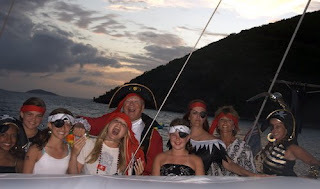 This was pirate night and everyone really got into the fun of it. Here's another example of the amount of space you have on Promenade. With this much room, you can either clump together in a group, or get away from the others for some quiet time to yourself. UPDATE: As most of you probably know, Rich injured his knee while on vacation. Rich goes to the doctor in the UK this Friday, so we hope to have some news on his condition next week. We are thinking of you Rich & Lisa! If you'd like more information on Promenade look at their online brochure and contact Paradise Connections.